It has been said that no person can step into the same river twice. This is because new water is always flowing and the person stepping in is always changed. It could be said that Rio en Medio's Danielle Stech-Homsy delivers a similar experience with her new album of inspired folk music, some covers, some originals, titled "Rio en Medio Radio." Shifting waters graze the shore, mesmerizing ripples evoke a myriad of images and sentiments, depending on what time of day it is or season of the year. Language itself turns fluid, as Danielle sings of things to be felt - and isn't that enough? - in English, French, Welsh and so on. If you've ever heard her music before, the approach will not surprise you - organic, spartan baritone ukulele, guitar, cosmic keyboards and harmonizing vocals form the backbone of the songs. Here and there a friend drops in to play along - in this case, Terry Cox, original member of the 1960's folk-baroque band Pentangle (& contributing drummer for David Bowie, The Bee Gees) lends his nuanced approach on drums, while Dave Roe (Johnny Cash & the Tennessee Three) chimes in merrily on bass to fill the speakers at just the right moments. Naybob Shineywater (Library of Sands, BrightBlack Morning Light) contributes lead guitar and percussion in highlighted places. Harmonica is played by George Flynn, a 90+ year-old war veteran & former chauffeur for Hank Williams. Rio en Medio is both an actual place on the map (Danielle's birth place in New Mexico) as well as an inner sanctuary, full of sounds and colors, born of the imagination of the songwriter herself. As Danielle puts it, she has been "spending a lot of time there lately" and has "gathered up song-flowers to share with the folks back home" (that's us). These tunes explore a thoughtful connection between nature, literature, traditional folk music, and pure flights of fancy. Delicate vocal lines and harmonies form a surprisingly strong thread, carrying the music along its watery path. 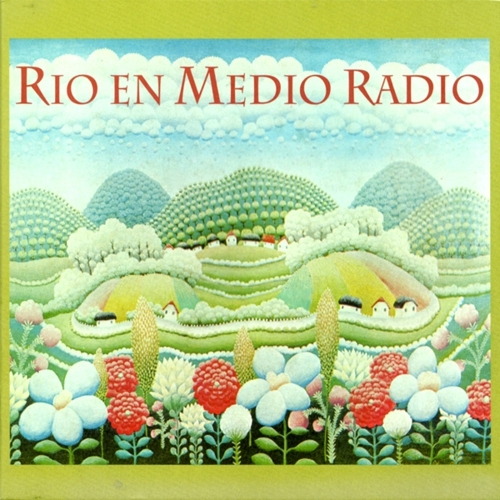 "Rio en Medio Radio" convincingly weaves a path through time, picking up voices from the near and distant past and igniting meaning with subtle instrumentation. For the song "Terrapin Karma," 12th century troubadour poetry opens a traveller's diary. Its meandering lyric is met by earthbound lines from Thoreau's "Walden" and it somehow all makes sense. In the song "The Fox & The Little Prince" Danielle explores song creation inspired by a meeting of creatures in the book "The Little Prince" by Antoine de Saint-Exupéry. Track 7 "Darlin' Corey" sprites Flynn's harmonica Americana while an old Martin guitar & Danielle's dynamic storytelling takes the radio a pilgrim's way to old American song, while "Y Deryn Du" a Welsh folk ode to a blackbird, is medlied with a timeless, anonymously-authored Italian song,"Sera Pasai". Danielle Stech-Homsy has been recording and performing as Rio en Medio since 2005. Her 2006 debut album, "The Bride of Dynamite," was released on Devendra Banhart's Gnomonsong label, followed by "Frontier" (2008, Manimal Vinyl). Rio en Medio has toured as main support/guest artist with notable bands such as CocoRosie, BrightBlack Morning Light, Grizzly Bear, White Magic and Devendra Banhart and has performed either solo or with full backing band on stages small and large from the USA to Europe to Australia, including notable festivals such as England's All Tomorrow's Parties. When not touring she teaches writing to children. In 2013 Danielle started a co-op label, Women's Work Recordings, which features exploratory and adventurous music by women artists such as Bay Area Koto master Shoko Hikage. Rio en Medio's 3rd album, "Peace Sequence," was released in 2013 on the same label and features a cover of the Grateful Dead classic "Mountains Of The Moon" which along with her original "Peace Song" remain a favorite among fans.